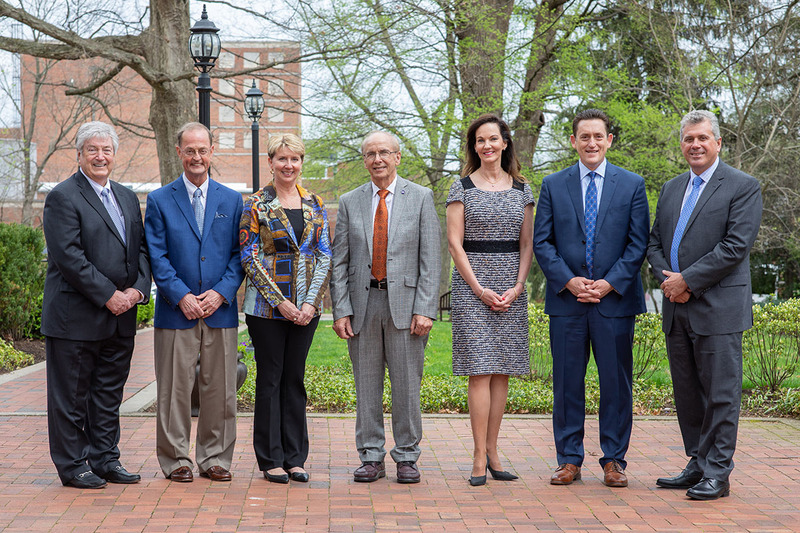 On April 12, the University of Kentucky College of Engineering inducted six new members into its Hall of Distinction. Initiated in 1992, the Hall of Distinction recognizes and honors those alumni who have demonstrated distinguished professional accomplishments, outstanding character and commitment to community service. This recognition serves to encourage exemplary achievements by current students and others. It is a symbol of the respect and admiration held by the University of Kentucky College of Engineering for these esteemed individuals. As chief operating officer of LG&E and KU, Lonnie Bellar is responsible for ensuring the company provides safe, affordable and reliable natural gas, electricity and customer service to 1.3 million customers in Kentucky and Virginia. Bellar became COO in March 2018 after climbing through the ranks of the electric and natural gas utility industry for more than 30 years. With 3,000 employees, approximately 400 of whom are engineers, Bellar has led the company to be among the top performers in safety, customer service and reliability; provide competitively priced energy; and become an innovator in service offerings. He also has completed executive education courses at the Harvard Business School and the Tuck School of Business at Dartmouth. For over 50 years, Skip Berry has poured his skill, talent and heart into the mission of Wehr Constructors, Inc., located in Louisville, Kentucky. Wehr Constructors has been rated the largest Louisville area general contractor for 20 of the past 24 years by Louisville Business First. In his 41 years as Wehr Constructors’ executive vice president and then president and chairman of the board, Berry has been responsible for over $1 billion in construction management projects, leading Wehr Constructors to a place in Engineering News-Record’s top 100 construction management firms and top 400 construction firms in the nation. The firm has completed high-profile projects such as the Humana Building in Louisville and the 21c Museum Hotel in Lexington, Kentucky. David Houchin is president and CEO of Intech Contracting, LLC, a Kentucky-based contracting company he founded in 1991. Intech specializes in bridge repair and restoration, inspection support and related services. The firm is notable for completing the painting of the John F. Kennedy Memorial Bridge in Louisville, Kentucky. Intech has also repaired or provided inspection services on more than 20 bridges that span the Ohio River, including the John A. Roebling Suspension Bridge in Cincinnati. Houchin’s company has also contributed to the restoration efforts of many landmark bridges across the country, including many of the 13 wooden covered bridges in Kentucky. Intech is nationally ranked as a top 600 specialty contractor and a top 20 painting contractor each of the past four years. Mary Beth Hudson is vice president of the Polysilicon Division and site manager for Wacker in Charleston, Tennessee. A proven leader with excellent interpersonal and communication skills, Hudson is responsible for all aspects of manufacturing, supply chain, business operations, sales and profitability of the Polysilicon Division throughout the North American and Central American regions. In 2016, Wacker opened a 550-acre greenfield site in Charleston, Tennessee, and tapped Hudson to lead its Polysilicon Division as vice president, including site manager responsibilities for the new facility. The Charleston facility employs 720 workers and boasts a production capacity of 20,000 metric tons of polycrystalline silicon annually. At $2.5 billion, Wacker Polysilicon is one of the largest private investments ever made in the state of Tennessee. Karen Maxwell’s love for computing began in the McVey Hall computer center, where she completed her computer science projects using punch cards. Although she never lost her interest in computing, today Maxwell is a business owner and philanthropist. She is co-founder and managing partner of KJMM Capital Partners, a real estate investment company. She was also founder and president of a design and decorating LLC. Her impressive IT career with leading companies in major end markets includes government, retail, banking, manufacturing, telecommunications and education. Maxwell now spends her time in Kansas City, Missouri, and Vail, Colorado, where she is active in both communities with several philanthropic endeavors. In his long career, Steve Polston has served as plant manager, senior vice president, chief operating officer, president and CEO for various nuclear energy and engineering companies. For nearly the past decade, however, he has put all of his leadership ability toward battling homelessness. Polston is recognized as a co-founder of the University of Kentucky Extended Campus at Paducah (UK Paducah), which opened its doors in 1998. Nearly 200 mechanical engineering and chemical engineering students are enrolled in the program. In addition to orchestrating corporate turnarounds at energy companies in the U.S. and in France, Polston is the founder and board chair for New Life Day Center, a mission in Lexington, Kentucky, that serves over 150 homeless individuals each day.